Editor/Author Wang, Binghe, Hu, Longqin and Siahaan, Teruna J. 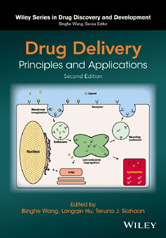 Following its successful predecessor, this book covers the fundamentals, delivery routes and vehicles, and practical applications of drug delivery. In the 2nd edition, almost all chapters from the previous are retained and updated and several new chapters added to make a more complete resource and reference.